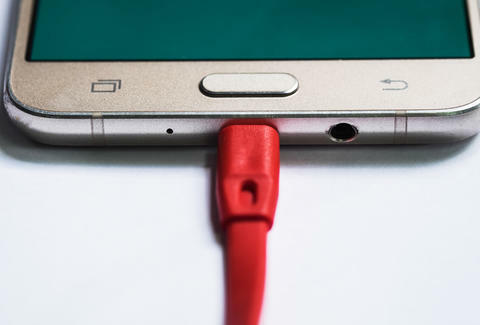 Good news for those of us who suffer from a chronic case of Crap I Forgot to Charge My Phone Again: New quick-charging tech will make it possible to get five hours of battery life after just a measly five minutes of charging. Even better, it may be integrated into new phones as early as next year. Qualcomm, the company that manufactures the processors used in nearly every top-selling Android smartphone, is claiming that its forthcoming Snapdragon 835 chip will boast what it calls Quick Charge 4 -- a feature that would enable a five-minute charge to juice up your device for five full hours. And there's good reason to believe it; devices currently packed with Quick Charge 3.0 (Qualcomm's last iteration of quick-charging tech) are capable of achieving an 80% charge in just 35 minutes. Quick charging is possible when a device is equipped with a processor that can accept a higher-than-normal current and voltage coming in from the charger, but it must be very delicately engineered so as not to become a combustible hazard (looking at you, Samsung Galaxy Note7). Luckily, Quick Charge 4 is compliant with recent charging recommendations from Google, which it recently laid out in an effort to prevent future smartphones from bursting into flames. Separately, researchers are currently working on developing computers and smartphones that will require 100 times less energy to run -- which means, eventually, you'll only need to recharge your device every three months. We aren't quite there yet, obviously, but five hours of juice in just five minutes is one hell of an improvement. As for when you might actually be able to take advantage of lightning-fast juice-ups, Quick Charge 4 is scheduled to be commercially available by mid-2017, which means that it will likely end up in new flagship Android phones from the likes of Samsung, HTC, and LG by then. Joe McGauley is a senior writer for Thrillist. Can he borrow your charger real quick?